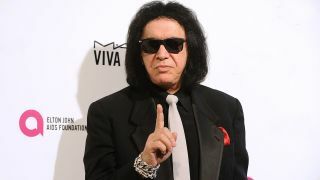 Kiss icon Gene Simmons says pop queen Lady Gaga is one of the few people capable of being the next global rock star. He made headlines round the world in 2014 when he proclaimed rock was dead – and now he’s predicted the end of rap too. Simmons tells Rolling Stone: “I’m looking forward to the death of rap. I’m looking forward to music coming back to lyrics and melody, instead of just talking. Repeating his assertion that “rock is dead,” he continues: “If Lady Gaga dropped the disco and the pole-dancing and all that stuff, and put together a rock band, that would be legitimate. “She’s got the musical goods. She can write songs, play instruments, and can actually sing. And she understands the fearless quality of spectacle. Meanwhile, Kiss have confirmed a one-night-only cinema screening of concert movie Kiss Rocks Vegas on May 25. It was recorded at the city‘s Hard Rock Hotel in 2014.